The game of baseball is a wonderful sport. However, there is no evidence that it was created by any one individual or a group of individuals. Given the right selection of materials, the equipment would come together through natural forces to form the field, the bases, and the viewing stands - all in the correct proportion and dimensions. It is only a matter of time and chance. The rules governing the game are also derived by natural forces over time. 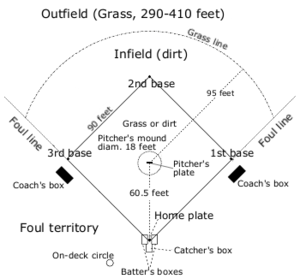 The number of outs, what constitutes an out, the direction the players move around the field, and the governing of various individuals to monitor the game in the form of umpires was all coordinated at precisely the exact moments the materials came together to fully form the rules and the structure of the game. The documents that "prove" there was a designer of the game are so old they are to be considered unreliable. There are no witnesses of any such person who created the game. As a matter of fact, there is evidence that the game developed over time from other games infinitely regressing to a single elemental game using a stick and a rock. Baseball came to be by chance over time. There is no reason to deduce there was any one or group that created the game. Those who believe so are superstitious, uneducated, and unintelligent.